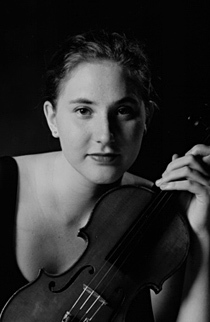 Andrea Hallam, viola, was a String Finalist in the BBC Young Musician of the Year, 1994. She received a First Class Honours degree from the Royal Northern College of Music, Manchester and the Artist Diploma from the Royal Conservatory, Toronto where she studied with Lorand Fenyves. Andrea is currently based in Vienna and enjoys a varied career combining solo recitals and concerto performances, chamber music and chamber orchestra work. She has been guest leader of the Ensemble Lyrique, Holland and the Austrian Ensemble for New Music, plays regularly with the Camerata Academica, Salzburg and is a member of the Vienna Chamber Orchestra. An experienced chamber musician, Andrea is a regular participant at International Musicians’ Seminar Prussia Cove-Open Chamber Music and the Wye Valley Chamber Music Festival. She has performed with present and former members of the Amadeus, Tokyo, Endellion, Orion, Chilingirian and Belcea string quartets, Raphael and Schubert Ensembles and Florestan Trio.